Like the struggle to win a $15 an hour minimum wage, the movement for free public higher education in the United States has gained significant momentum over the past two years. What was once the struggle of a dedicated few has now become a national debate, and several states (including Tennessee, Mississippi, and Oregon) have already passed or are considering legislation to make community colleges tuition free, and President Barack Obama has called on all states to eliminate community college tuition. Meanwhile, Democratic Presidential hopeful and U.S. Senator Bernie Sanders has gone even further, introducing legislation in May that proposes to make every public college and state university in the country free, and calling for a million student march on Washington. Though Sanders’ legislation is unlikely to pass, it is clear that the current neo-liberal agenda of austerity and privatization is increasingly untenable, and support among the 99% for free public higher education is rapidly growing. Actually winning such a victory, however, as Elan Axelbank notes in his June article for Socialist Alternative, will not be easy and will require a sustained and even more determined mass movement of students, educators, and activists. In what follows I will explain briefly why Socialist Alternative’s demand for “free, high-quality public education for all from pre-school through college” is so important, what a free higher education system might look like, and what we will have to do to make it a reality. It wasn’t that long ago that many of the nation’s most prestigious public university systems were entirely or mostly free. Both the University of California and the City University of New York systems, for instance, charged little or no tuition until the 1970s and 1980s, when capitalist crises and a conservative tax revolt led to reduced public spending and steady increases in tuition and fees at almost all public universities and colleges. More recently, powerful corporate interests and politicians from both parties, driven in part by an ideological commitment to the supposed virtues of the free market, have conspired to mount a full-on assault on the public sector. Through a process of strategic underfunding and privatization, these forces have managed not only to radically reshape the landscape of American higher education, but have also aimed to convince ordinary people that education is not a right to which they are entitled as citizens, but rather a good they purchase as consumers. This model of education as product has had a devastating impact on the culture of higher education. Students are now frequently treated more like customers than citizens, and administrators often view their schools as corporations rather than public institutions. As a consequence, a corporate ethos of marketing, cost-cutting, and competition has replaced the guiding tenets of critical inquiry, access, and public service that fueled the progressive rise of public education in the late nineteenth and early twentieth centuries. Boards of Trustees, stacked with corporate executives, have wasted billions on sports stadiums and luxury student centers designed to attract new students and have increased pay for presidents at many schools to corporate CEO levels, all while raising tuition, cutting services, and replacing good-paying campus jobs with low-paying contingent employment, including the increasing use of part-time, adjunct faculty, who are often paid near-poverty wages. Not surprisingly, this corporate climate and the continued underfunding of public higher education, combined with increasing education costs, have led to skyrocketing tuition increases and massive fees that often hit working students the hardest. At the University of California, for instance, in just one decade yearly in-state tuition increased from an already unaffordable $4,354 in 1996 to more than $12,804 in 2015. That’s more than $50,000 for a four- year degree, not including books and room and board. Meanwhile at the City University of New York, a system with a historic mission to serve the poor and working class of the city, tuition and fees have increased almost 40% (to $6,330 per year) since just 2010, and the percentage of university costs covered by state and federal funding has plummeted since the 1990s. To add insult to injury, federal Pell Grants, which have historically helped the neediest students attend college, were cut in 2015. As a consequence student loan debt now exceeds credit card debt in the United States, averaging $35,000 per borrower, and total student loan debt in the US is now more than $1.2 trillion. That’s more than the combined credit card debt of every person in the country. Although the problems facing higher education are enormous, the solution to this affordability crisis is, on one level, quite simple: make it free! If we want to fix higher education we must fight for greater funding, the complete elimination of tuition and fees, cost of living and book stipends to all students who need them, and demand that public colleges and universities finally live up to the promise of their original missions: to provide a rigorous and broad education to the mass of working and middle class Americans. Though such a move might sound radical, the benefits would be enormous. Not only would it lead to greater economic, racial, and social equality, it would also drastically improve college access and graduation rates, reduce costs, and positively alter the way we think about the value of education. Perhaps one of the most important changes we would see if we were to shift to a tuition-free system of public higher education would be a steady increase in the number of students who both enroll in and complete college degree programs. President Obama has said he wants more Americans to attend and complete college within the six-year window that has become the new average time for obtaining a bachelor’s degree, but he has done little to address the underlying reasons why they don’t. Making public higher education free and supporting students with stipends, as Sweden and Germany do, would not only encourage more students to attend college, but would ensure that many more of them finish their degrees in a timely manner. The logic is clear: the less students have to worry about making ends meet (the less they must struggle to pay for tuition, books, transportation, and housing) the more time they will have to study and focus on their schoolwork. When students don’t have to choose their classes around their work schedules, they will be more likely to complete requirements without taking additional semesters. And when students have more time to spend on campus, they will be more likely to be involved in the kinds of extra-mural activities that keep them engaged and interested and which help them to succeed academically. Currently, in the United States, only about 50% of students who attempt to obtain a bachelor’s degree do so within six years, and graduation rates for 25-34 year-old students have fallen sharply compared to other countries where tuition is free. In fact, of the 25 countries compared by the OECD (Organization for Economic Co-operation and Development) in 2012, the United States, which in previous measures had been ranked at or near the top, was ranked just 19. Meanwhile, countries where higher education is free have, despite their own struggles against austerity, seen huge increases in college attainment. Currently in the US only about 39% of 25-34 year olds will graduate with first-time bachelor’s degrees, while in Iceland, where education is free, more than 60% of people in this age cohort are expected to obtain degrees, and Iceland is predicted to outpace the United States for the total percentage of college graduates per capita soon. Furthermore, three of the other top six countries with the highest rates of first-time bachelor’s degrees, including Poland at 53%, Denmark at 49%, and Finland at 47%, also have no tuition fees. It is clear from the statistics that at the very least there is a strong correlation and likely direct causal connection between free public higher education and increases in college attainment. But what about costs? Wouldn’t making public education free require a huge amount of new investment and massive increases in taxes? Although making college free for everyone who wished to attend would in fact require more public funding than is currently provided, the actual numbers are less than you might think. As Ann Larson and Michael Checque have pointed out, the US government already spends billions on higher education subsidies, such as tax exemptions on student loan interest and Pell Grants to rapacious for-profit institutions like the Corinthian Colleges (which account for a significant percentage of student loan defaults). If you take into account this money currently spent or wasted on for-profits, plus all of the money state and federal governments already spend, the total additional cost to make public higher education free across the country would be just $15 billion. To give some sense of how little money this is, consider that the Pentagon’s F-35 fighter jet program was $163 Billion over budget! So making education free is, quite simply, imminently affordable. But providing tuition-free education is also much more cost efficient than charging tuition. Under the current system of funding (a combination of decreasing public spending and increasing tuition and fees), public universities are compelled to compete against each other and private colleges to attract more tuition-paying students, wasting billions on stadiums, luxury dormitories, recreation centers, and extravagantly paid “star” professors, the cost of which is then passed on to students in the form of fees and tuition. Remove tuition and competition and you remove the dual incentives to waste money on non-academic needs, while prioritizing the academic mission of universities. This means that tuition-free public universities could actually provide a higher quality academic experience for less money per student. But of course if we want a truly equitable and socially productive public university system, we will have to do more than merely cover the costs of tuition and fees. Most students will still need help with living expenses, books, and transportation, costs which are often paid for through student loans. Therefore billions more would have to be made available each year to cover the cost of quality dormitory housing, books, and living stipends for working and middle class students. Efficiently planned, such benefits could easily be provided to all public college and university students for just a tiny fraction of the trillions wasted by the Pentagon or the $100 billion in tax exemptions provided to corporations each year. This readjustment of priorities would also have a profound beneficial impact on our society as a whole. Not only would it practically eliminate future student loan debt and create greater social mobility and economic equality, it would also provide a living model for the public funding of other human necessities such as healthcare, electricity, and internet access. 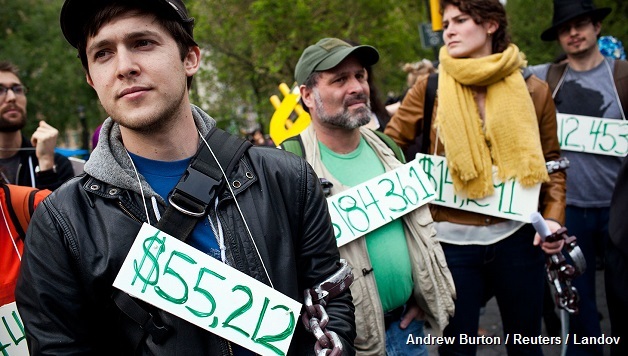 As mentioned earlier, average student loan debt in the United States upon graduation is $35,000. Even though they frequently attend more inexpensive colleges and universities, this debt burden still falls disproportionately on the poor and working class students whose parents cannot afford to pay the costs of their education, and this burden has significant consequences. For many students, the cost of college and the thought of a life-time of debt is itself a massive deterrent to pursuing a college education. As the Illinois Student Assistance Commission documented, “Financial constraints was the number one reason (79%) given by college counselors for why some of their college prep seniors did not go on to college.” But the problems do not end there. As The Atlantic recently reported, while many millennials are struggling to get by in the recession economy, those whose parents paid for their educations are doing significantly better. Because they begin their adult lives debt-free, these lucky few are, among other things, much more likely to purchase homes earlier than their debt-burdened peers, which means significantly greater wealth over the long term. It’s easy to see that college costs are a clear contributing factor to the destruction of what little social mobility still exists within the United States, reinforcing the already deep divides between the haves and have-nots. Providing free access and living stipends for college students would mean no student would have to worry about whether or not they could afford college, and that graduates would be able to begin their adult lives debt-free. But there are other non-material benefits that would also accrue from making college education free. The first political benefit is that a system of free higher education, in which students are fully supported by the public, would operate as a model for removing the profit incentive from other industries such as healthcare and energy. If we could provide a free high-quality public higher education to everyone who desires it, why could we not provide free high-quality healthcare, clean, low-cost energy, and free internet access? Free public higher education would be an incredibly popular program and would offer Americans at least a small taste of how a socialist political economy could function. In addition to the political victory free public higher education would represent, it would also positively alter the way that we think about the value of education itself. Currently, because of the economic risks involved, many students view higher education as a commodity to be purchased, or as some kind of investment towards greater future earnings rather than an opportunity for intellectual growth and development. Because of this they frequently pursue “safe,” career-focused majors, limiting their exposure to the liberal arts and sciences that provide adults with the foundation they need to become active and engaged citizens. If higher education were made available to absolutely everyone who wished to pursue it, then education would no longer be seen as merely a means to end. Instead, like secondary education, it would be viewed as a benefit to society and a path to human self-actualization. 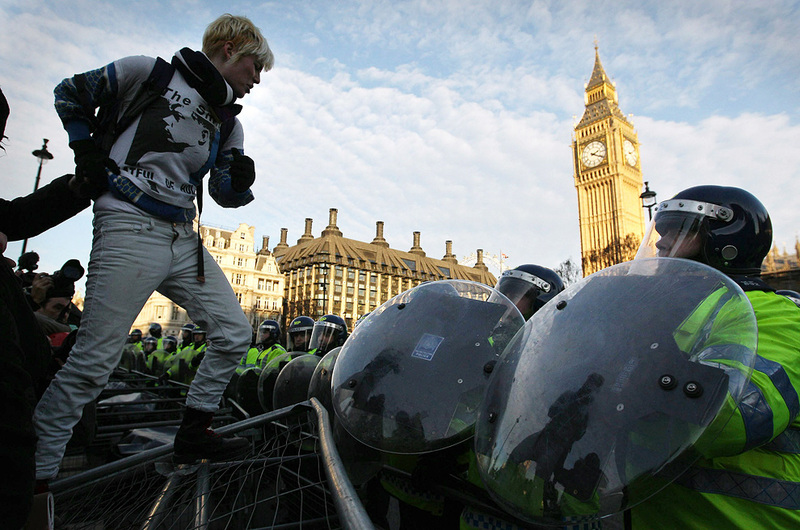 A student protester confronts London riot police in Parliament Square December, 2010. The benefits of free public higher education are many and creating such a system would be economically viable without any increase in taxes. But while the economic challenge is easily surmountable, the political challenge, the struggle against the bipartisan policies of austerity and privatization, will be much more substantial. Although the vast majority of Americans, (79% according to Gallup) believe that higher education is unaffordable, and though some politicians say they support measures to make higher education free, it is unlikely that such proposals will stand much of a chance in the U.S. Congress or state legislatures unless there is a mass movement in support of them. Like in all struggles for social progress and change, we cannot sit idly by and expect those in power to do the right thing. This movement will have to begin at the grass roots, with the students who are most directly affected by skyrocketing tuition, and build out from there to engage with larger communities of workers, parents, and the poor. 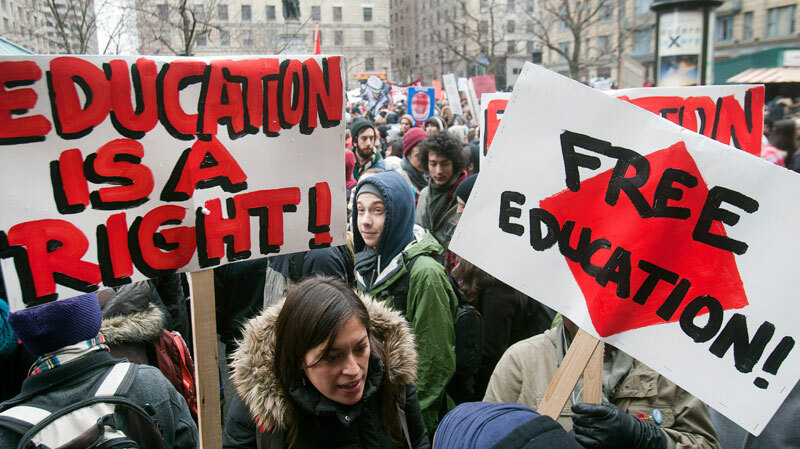 Over the last four or five years there have been several high profile mass student protests from London to New York City against cuts to higher education and increases to tuition and fees—a clear sign that students are fed up. But we have yet to see a sustained national movement for free tuition. Though it’s important that we continue to fight against future cuts and increases to tuition, it is also imperative that we begin to build a movement that demands more than merely the maintenance of the status quo. Like the movement for a $15 an hour minimum wage, we must demand more than what the system is willing to give, otherwise, we gain nothing. To actually win this fight, however, and we can win, we will have to build a massive and sustained movement of students and educators willing to shut down their campuses and to coordinate national and state-wide actions to demand free public higher education. Are you ready?